The choice of an appropriate hotel is very important in order to spend nice vacations. Before making a reservation, the features and the location of the Hotel have to be taken into consideration. You can find all kinds of hotels in San Francisco, from the youth hostel to the 5 stars. 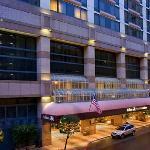 Choose a hotel adapted to your needs in order to enjoy and to discover San Francisco in the best possible conditions. You are probably asking yourself, if you are going to book a hotel in Downtown San Francisco or in another Neighbourhood. You have to consider different factors. If you are driving, it would be better to book in the Marina district or in the surroundings of the Golden Gate Bridge. Indeed, the parking spaces are very expensive in Downtown San Francisco. Moreover, public transportations function very well in San Francisco. You can move around the city very easily. Reserve your room with Booking.